← 1497 – What’s for dinner? As told in the first post about this forgotten skete (1493) we could not enter the katholicon, because the workmen were not in possesion of the key. It gave me the opportunity to take some pictures in the exo-narthex. 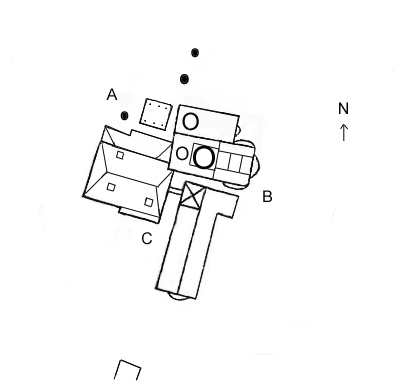 On this map the exo-narthex can found at B – the katholikon with the two domes – under the lesser dome. It is attached to building C, the guesthouse. 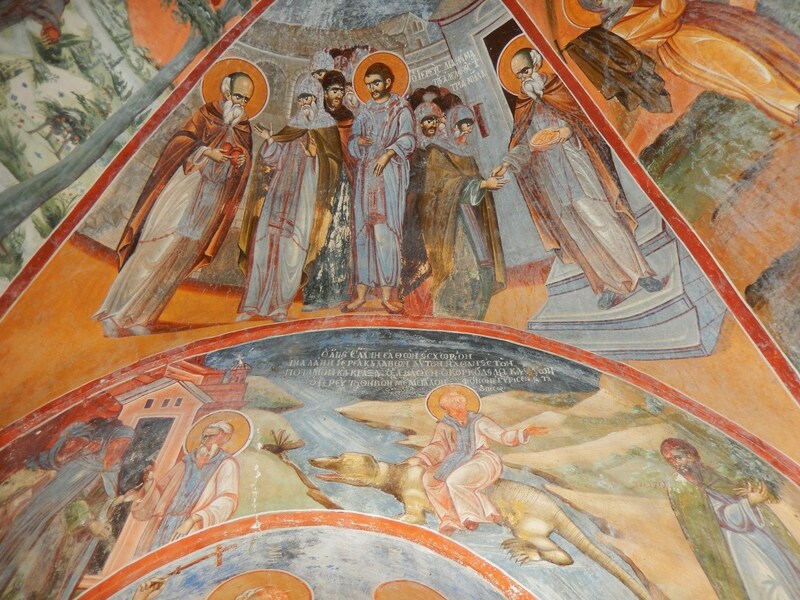 The frescoes are of high quality, not refined, but painted by an artist who did not need many paint or brushstrokes to express himself. 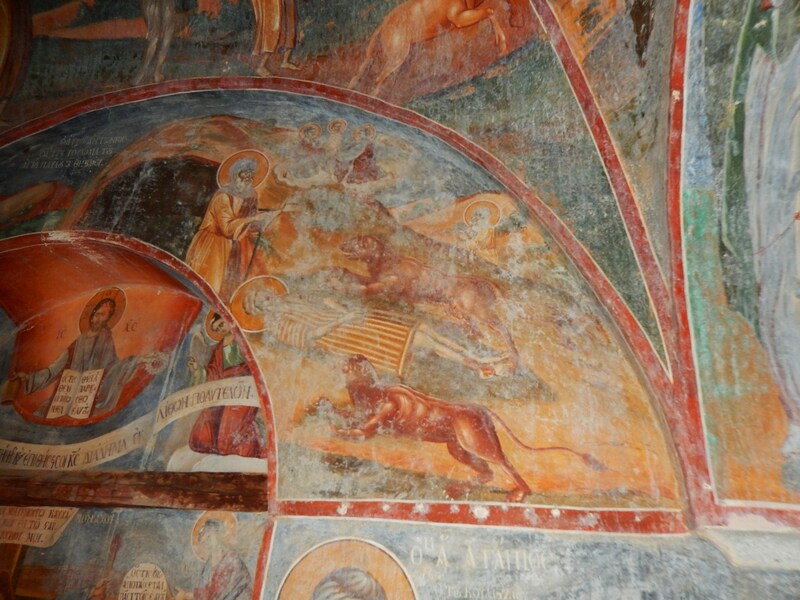 The overall condition of the frescoes is very poor. 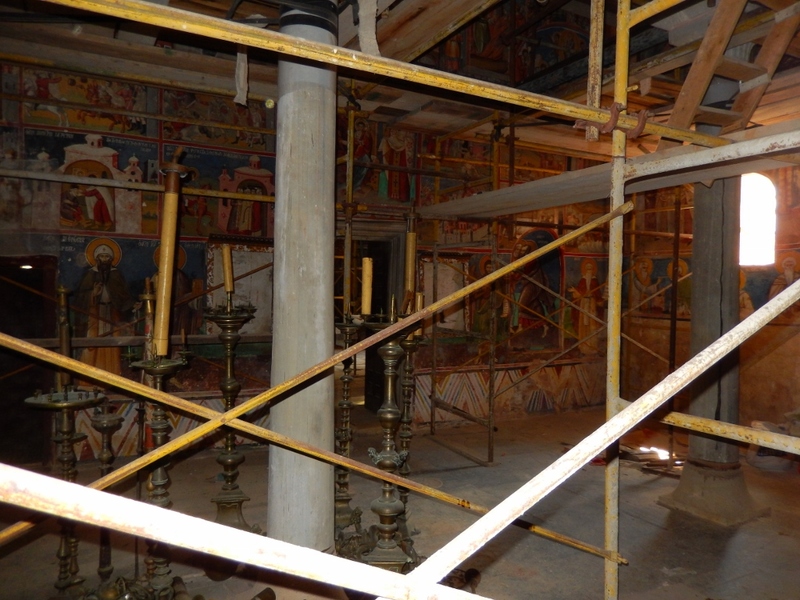 It looks like the frescoes in the church will be restored in the near future, because the whole church is filled up by scaffoldings. 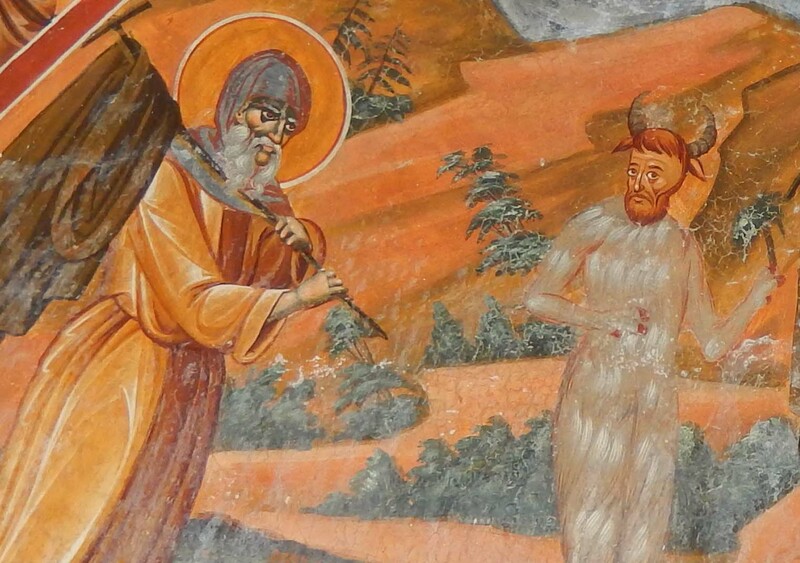 The first fresco I photographed is a scene with a Crusified Monk, with a soldier giving him a sponge with water. Death is coming from the grave and angels and demons surround the cross (read more here, thanks to our reader ‘deepblue’). 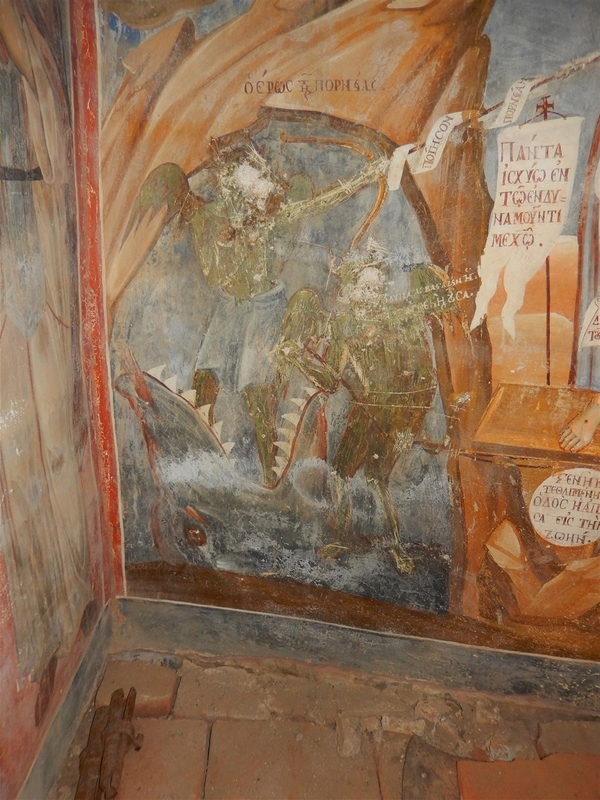 A badly damaged detail of the the fresco of winged devils, one of them with a bow, fall in the mouth of a monster (with Mount Athos in the background?). 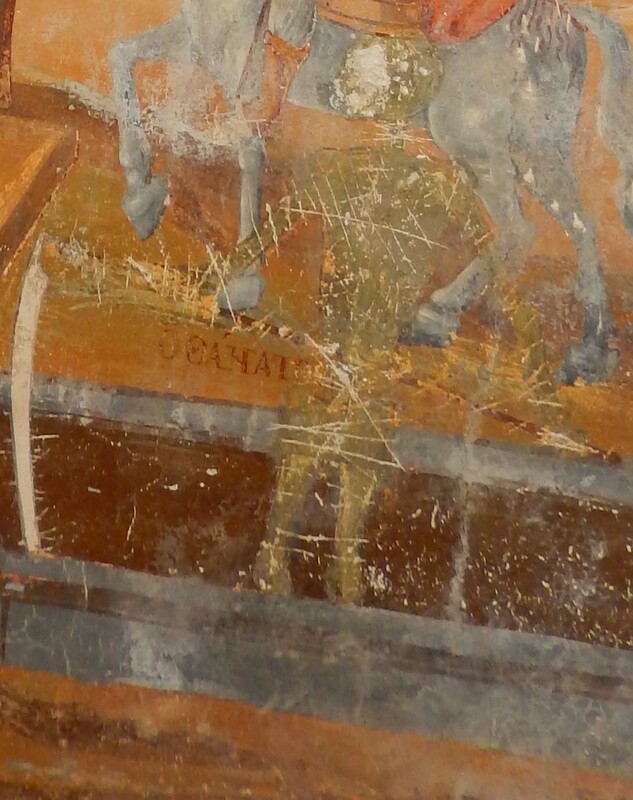 A detail of Thanatos – Death with his siskin. 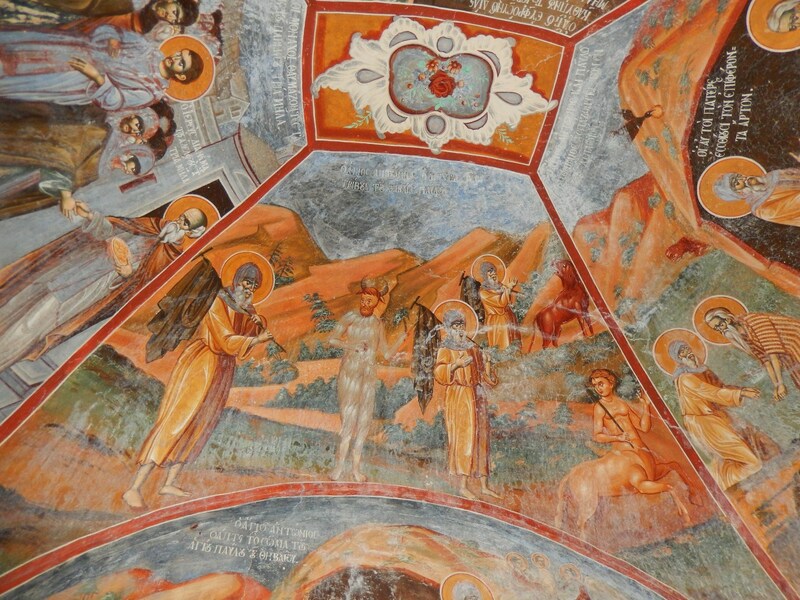 Like most frightfull figures on Athos-fresco’s, the body and head (especially the eyes) are badly damaged by pilgrims. 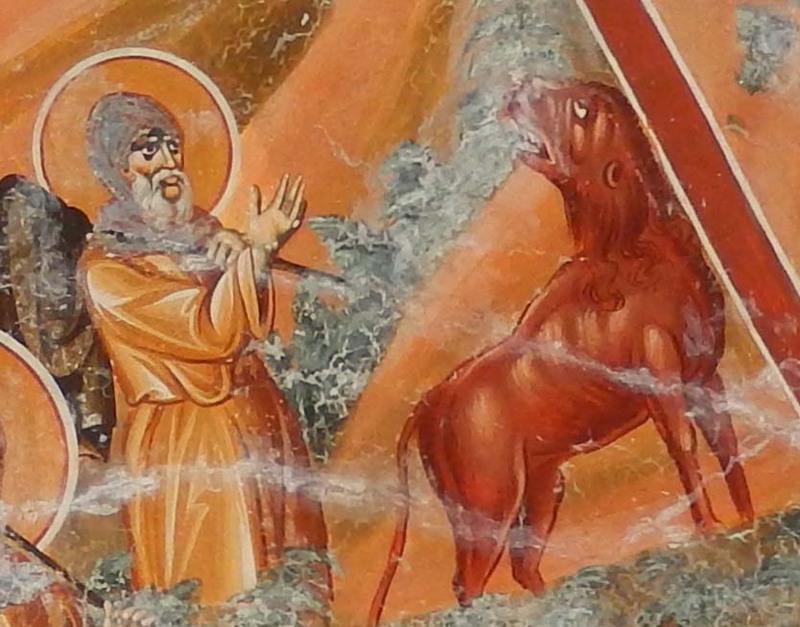 The next fresco in the first dome depitcs scenes from the life of Saint Anthony. 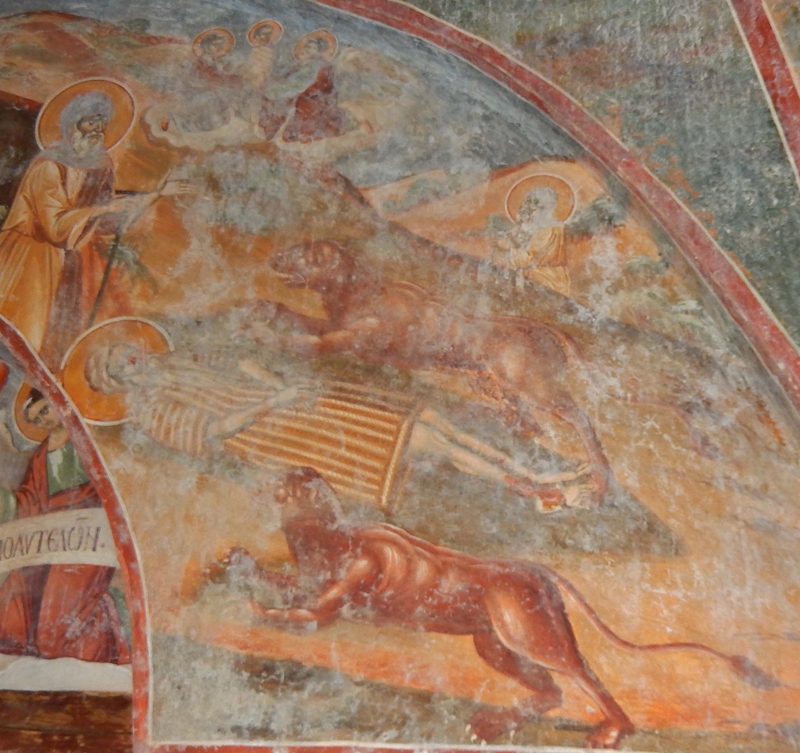 To finish this blog I’ll show you another scene of the live of Anthony, I think it must be the story about the temptation with a plate with silver coins, that the devil must have laid out in the desert to tempt him. In the arch you can see a Saint (again Anthony?) 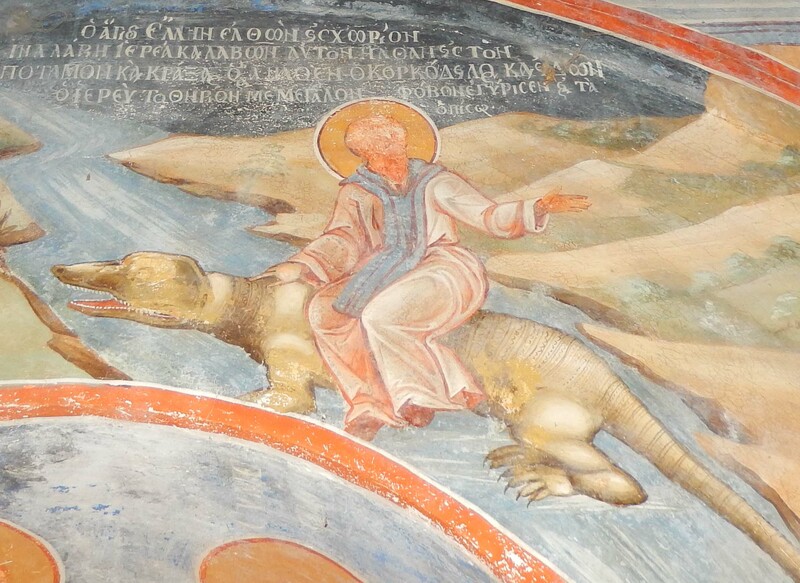 sitting on an crocodile-like animal. 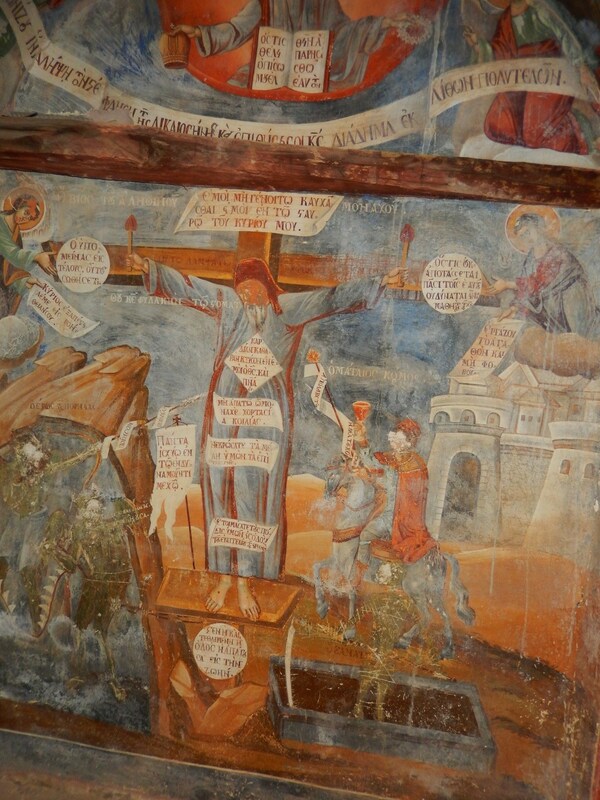 This entry was posted in art, Dimitriou, skiti, trip 2013 and tagged Frescoes. Bookmark the permalink. It’s not Christ. 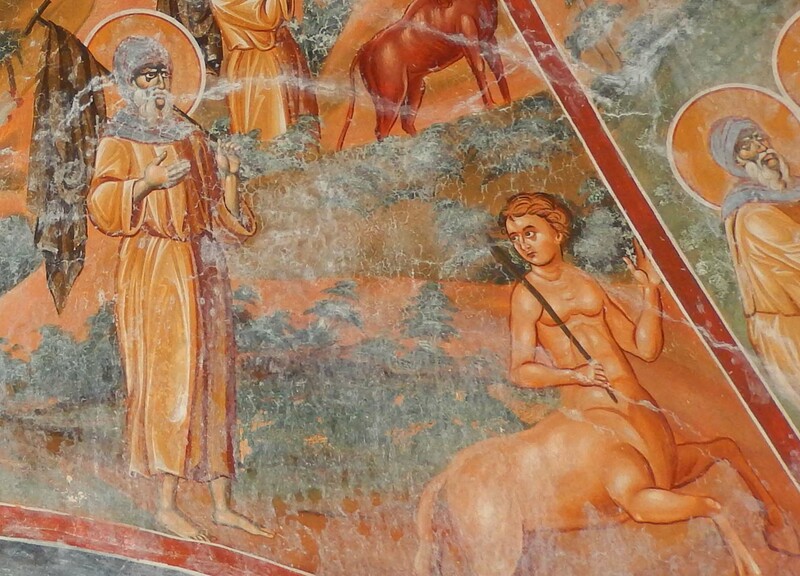 It’s a depiction of life of the monk.